At JEM Engineering, we understand that accurate measurement of antenna electrical performance is critical. That’s why we offer a range of rapid testing services from 50 MHz to 40 GHz for antenna, microwave and communication systems. Frequency ranges from 50 MHz to 40 GHz, covering standards such as Bluetooth™, WiFi, WiMAX, GPS, cellular, and more! JEM houses multiple RF test chambers at our facility in Laurel, MD, centrally located between Baltimore and Washington, D.C, and convenient to Dulles International, BWI, and Reagan Washington National airports. Customers testing at JEM have the advantage of working with our knowledgeable and experienced onsite RF technicians and engineers, who provide guidance and support to the testing experience and can assist with data analysis and interpretation. We have the highest commitment to your business’s proprietary designs and trade secrets, keeping everything you give us – as well as resulting test data – under careful lock and key. Furthermore, we promise to provide the most experienced test technicians and antenna engineers, providing you with the best value of high accuracy antenna testing in the industry. To learn more and to find out if rapid RF testing from JEM Engineering is a good fit for you project, contact us at (301) 317-1070 or request a quote online for antenna testing services. JEM has decades of experience in the custom antenna design and development and RF testing services industry. We promise customers a full 100% satisfaction guarantee of products and services, including rapid testing services for government and commercial applications. At JEM, we are dedicated to improving performance, efficiency and overall business of our customers. Because of this dedication, we are always innovating alongside our customers to improve current products and tackle challenges. JEM Engineering’s team boasts over 150 years of combined experience, allowing it to take an antenna concept all the way through to full-scale production. Not only do we deliver quickly, we also extend our full satisfaction guarantee to all of our customers on all of our products, as well as our services. We are a 100% women owned small business. JEM Engineering is a minority owned company and in honor of Black History Month we would like to shine light on two Black engineers who have made an impact in the world of engineering. 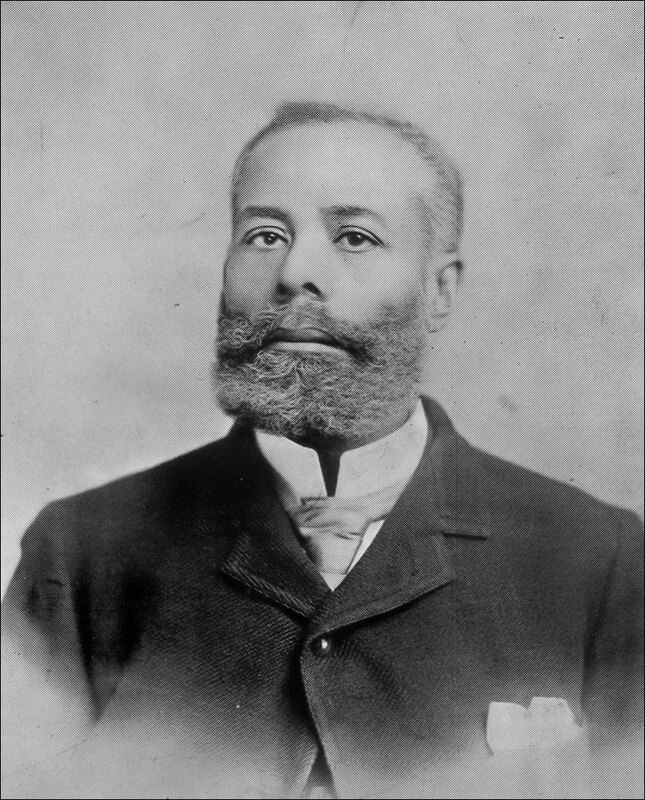 Elijah McCoy was born in Colchester, Ontario, Canada on May 2, 1844. His parents were George and Emillia McCoy, former slaves from Kentucky who escaped through the Underground Railroad. George joined the Canadian Army, fighting in the Rebel War and then raised his family as free Canadian citizens on a 160-acre homestead. Elijah moved to Ypsilanti, Michigan but was unable to find work as an engineer due to racial barriers. He was thus forced to take on a position as a fireman and oilman on the Michigan Central Railroad. As a fireman, McCoy was responsible for shoveling coal onto fires which would help to produce steam that powered the locomotive. As an oilman, Elijah was responsible for ensuring that the train was well lubricated. After a few miles, the train would be forced to stop, and he would have to walk alongside the train applying oil to the axles and bearings. Dr. Aprille Ericsson was born in Brooklyn, New York in 1963 and raised in the Bedford Stuyvesant neighborhood of Brooklyn. In junior high she won second place in the science fair, played on the girls’ basketball team and was a member of the science club, honors club and school band. Dr. Aprille Ericcson graduated high school with top honors and attended the Massachusetts Institute of Technology (MIT) where she was involved in several research projects with the applied Physics Laboratory that included the development of a fiber optic laser gyroscope, and the creation of a database for EVA neutral buoyancy data calculated at the NASA Johnson Space Center. 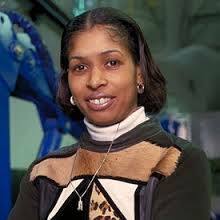 After earning a Bachelor of Science degree in Aeronautical/ Astronautical Engineering at MIT, Dr. Ericcson attended Howard University in Washington, D.C. She became the first African- American woman to receive a Ph.D. in mechanical engineering at Howard University and the first female African-American to receive a doctorate in engineering from the NASA Goddard Space Flight Center. Her many honors include: The Women’s Network, Top 18 Women Who Will Change the World; Women in Science and Engineering for Engineering Achievement; National Technical Association, Top 50 Minority Women in Science and Engineering, 1996-97; NASA representative to the White House; and most recently in 2016, the Prestigious Washington Award. 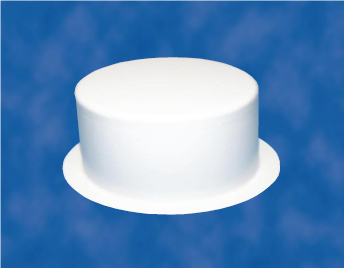 JEM Engineering’s HSA-2438 Antennas are Concealed and Low-Profile Antenna Products. 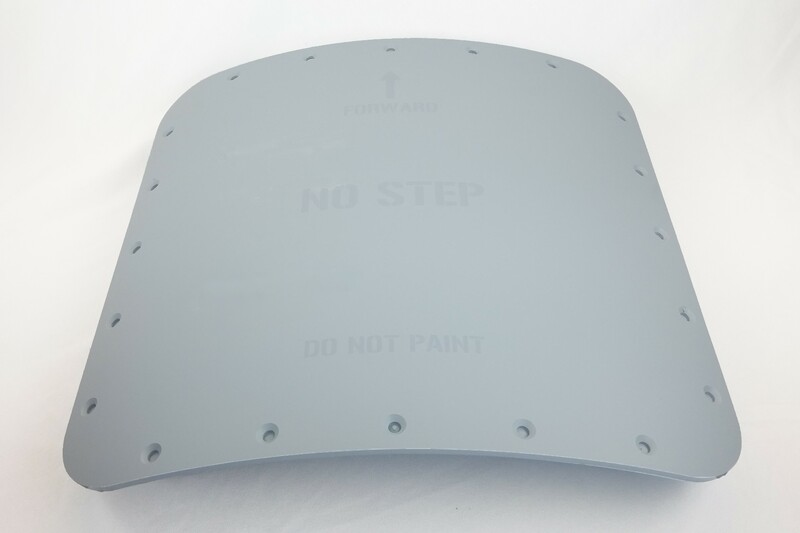 The HSA‐2438 hybrid spiral antenna is designed for UFO and MUOS SATCOM band and vehicular use. The antenna operates on 244 – 270 MHz, 292 – 320 MHz, and 360 – 380 MHz and has been optimized for the MUOS bands. The unique pattern is designed for cardioid shaped gain overhead to 10 degrees in elevation where SATCOM links are more difficult to close. 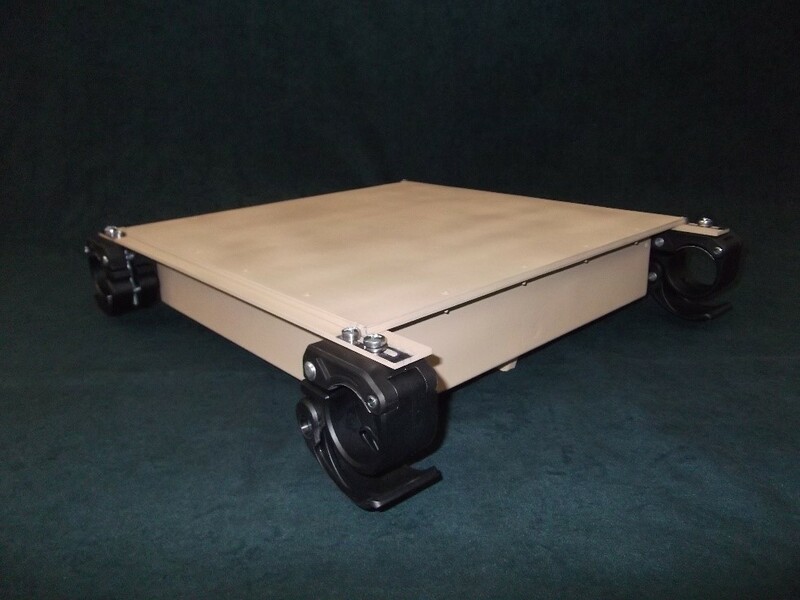 The hybrid spiral antenna can be mounted on a vehicle surface with no degradation to the pattern or VSWR and is ground plane independent. The HSA-2438A Initially designed for flush mount on a tubular chassis mounting, this low-profile, compact spiral antenna is suitable for vehicular or airborne use. The pattern is designed for uniform gain overhead to 45 degrees in elevation. The hybrid spiral antenna can be flush mounted on a vehicle or airborne surface with little to no degradation to the pattern or VSWR. This rugged spiral can be equipped with a side or bottom mounted connector. The HSA-2438C is designed for a conformal airborne application operating in extreme environments, vibration, and speed. This low-profile, compact spiral antenna is suitable for vehicular or airborne use. The pattern is designed for uniform gain overhead to 40 degrees in elevation. The hybrid spiral antenna can be flush mounted on a vehicle or airborne surface with little to no degradation to the pattern or VSWR. This rugged spiral can be equipped with a side or bottom mounted connector. HSA-2438 Initially designed for flush mount on a tubular chassis mounting, this low‐profile, compact spiral antenna is suitable for vehicular or airborne use. The pattern is designed for uniform gain overhead to 40 degrees in elevation. The hybrid spiral antenna can be flush mounted on a vehicle or airborne surface with little to no degradation to the pattern or VSWR. This rugged spiral has optional side or bottom mounted connectors. Learn firsthand how JEM Engineering is dedicated to developing and producing top quality antennas for their customers. 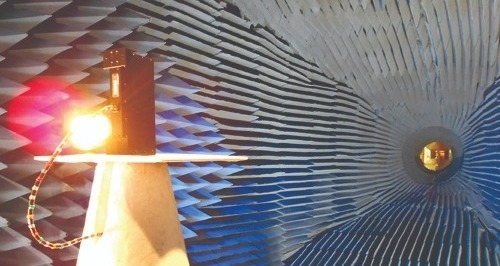 Contact JEM Engineering for a free consultation and a quote on testing your antenna in the TATF Chamber at JEM. JEM Engineering boasts two antenna testing chambers at our facility in Laurel, MD, within easy reach of both Baltimore and Washington DC. Customers testing at JEM have the advantage of working with our knowledgeable and experienced RF technicians and engineers, who provide guidance and support to the testing experience, as well as assist with data analysis and interpretation. While our experts can easily determine which chamber is suitable for a particular test, it’s also helpful to know what each chamber’s capabilities are. The TATF is ideal for testing over a variety of frequencies. A Tapered Antenna Test Facility (TATF) Chamber provides powerful validation capabilities over a wide frequency range, allowing the testing of antennas and antenna systems for a variety of applications. Using these tools, we can measure radiation patterns, antenna gain (peak, average, max linear, min linear, H and V) and axial ratio from 80 MHz to 40 GHz. Test times depend on the number of frequency points taken, the number of angular steps measured, and the amount of noise correction applied. The max power at the input port of the PNA is +30 dBm; however, we can add a pad in line to allow gain much higher (as much as +110 dBm). The SNF can test a smaller range of frequencies, but it can complete tests in as little as 15 minutes. A Spherical Near-Field (SNF) antenna test chamber is the fastest facility available for full 4 pi steradian data collection. It uses an array of electronically scanned probes to scan a full 360-degree measurement plane, giving technicians the ability to complete measurements in minutes rather than hours. 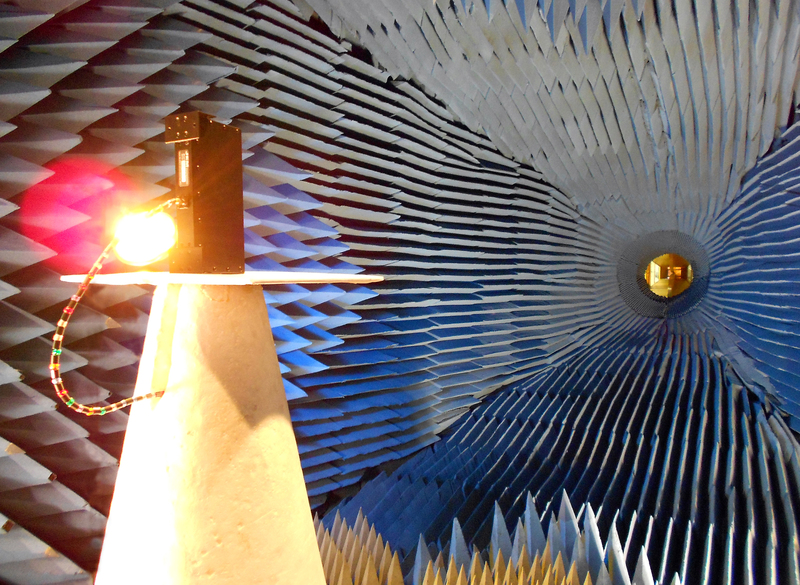 This chamber can perform tests over frequencies from 400 MHz to 6 GHz, enabling testing of antennas for AMP, PCS, GSM, Bluetooth™, IEEE 802.11, GPS and other new and evolving wireless systems. The spherical chamber at the testing facility at JEM can be customized to work for any antenna. While existing structures are in place that work with testing for most antennae, JEM Engineering also works with customers to custom design fixtures that will work to test any type of device. 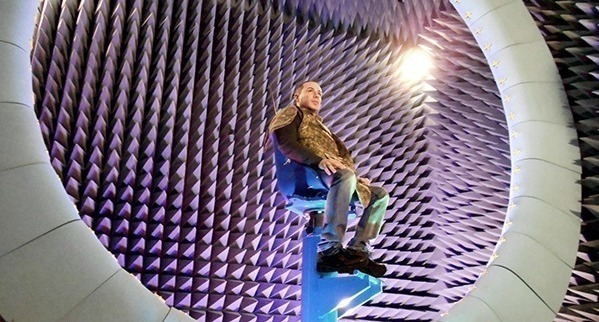 The SNF Test Chamber can be used to test active devices, antennae with an amplifier or an attenuator, and even can be used to test a body worn or handheld device on a subject. By mounting the antennas in free space or on human subjects allows for the measurement of radiation patterns, efficiency, average gain, and any human body interaction to the radiating device. As with the TATF, our engineers can produce test information in a variety of formats. *25dBi is the ceiling for gain measurements. A pad can be installed in our system to protect the equipment from saturation. Learn firsthand how JEM Engineering is dedicated to developing and producing top quality antennas for their customers. Contact JEM Engineering for a free consultation and a quote on testing your antenna in the TATF and SNF Chambers at JEM. 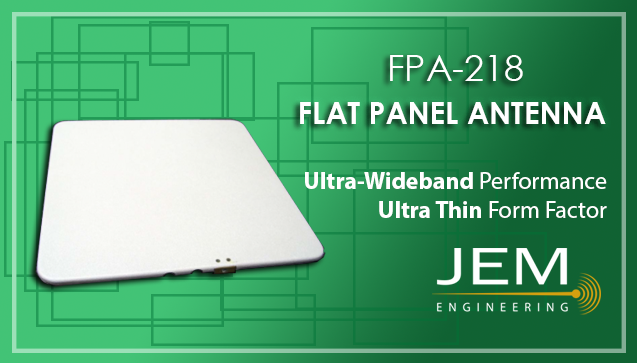 The FPA-218 is vertically polarized, flat panel antenna which provides high‐level performance in a unique, low-profile design. It maximizes transmission/detection while taking up minimal space. With an ultra-wide frequency range, this system is excellent for ELINT/SIGINT requirements over a broad band. The ‐2 version provides a dual output and ‐3 provides a three output system. STEM is all about innovation. The goal of STEM Day is to not only acknowledge those who work in fields related to Science, Technology, Engineering, and Mathematics, but also to encourage young minds to follow their passions and pursue such careers. JEM Engineering is proud to have an extremely skilled and diverse group of individuals who make things happen! We asked our very own Matt Berry (Mechanical Engineer) and Anjali Bhattarai (Electrical Engineer) to talk about why they chose their career paths. What is it about engineering that interests you? A: As an electrical engineer, I find the concept of energy very enticing. Every object in the universe requires energy to perform its activity. Having the opportunity to generate and control electrical energy is definitely the best part. There’s also the added benefit of working with high tech gizmos like cell phones and smartwatches before they hit the market. Did you always know that you wanted to be an engineer? If not, what was your first career choice and what made you switch to engineering? A: As a kid, I wanted to be an archaeologist. I later acknowledged my knack for analytical thinking, so I pursued engineering during my high school years, and later received a full scholarship to study engineering in college. What would you say to persuade or encourage someone to study –or even pursue a career– in STEM? M: STEM explains how things work, from something as simple as how water freezes to as complicated as a how a space shuttle can reach the moon. Engineering is problem solving and design. Both can be applied to any career you may see yourself doing, whether it be handling the foot traffic of hikers or directing water away from trails at a national park, or designing a robotic prosthetic to help those with a missing limb. Engineering is fun and challenging every day. A: It pays well (laughs). As an engineer, you earn the skill set to transform your imagination into reality. Engineering teaches you how to better your concept and design through trial and error. It also alters your way of thinking by sharpening your analytical skills, making it easier to grasp any concept quicker. You become a problem solver and tackle important issues of the world. For instance, I once helped design a robot that could isolate and burn off cancer cells without harming healthy organs. With further research, it could have replaced chemotherapy. Like Matt and Anjali, JEM Engineering proudly supports students and professionals in pursuit of careers in STEM! The MBA-0162, also known as the “Sentry,” is multi-band array designed for SIGINT and ISR applications, this compact, low-profile, single-port antenna is the ultimate all-in-one solution. The sentry optimized for the 400 to 2700 MHz applications and has an efficiency of over 50% for the aperture across the entire band. 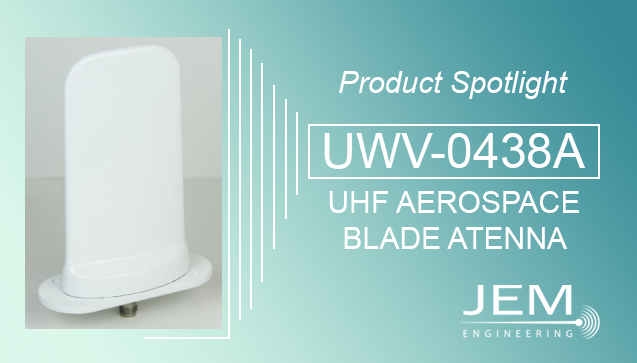 This versatile antenna can be installed in many locations on any aircraft or on other vehicles. JEM’s Tapered Antenna Test Facility (TATF) Chamber provides powerful validation capabilities over a wide frequency range, allowing us to test antennas and antenna systems for a variety of applications. Using these tools, we are able to measure radiation patterns, antenna gain (peak, average, max linear, min linear, H and V) and axial ratio from 80 MHz to 40 GHz. Our existing structures allow us to fixture multiple antennas during the allotted test time. If the weight of the antenna under test is off-center by more than 36”, or if the antenna requires a specific configuration, a custom fixture may be necessary. Customers have the option to design, as well as provide their own fixtures. Also, JEM may design and build a custom fixture for a separate fee. Over the past 16 years, JEM Engineering has designed and manufactured an extensive product line of antennas, ranging from frequencies between 2 MHz to 40 GHz. We pride ourselves in our ability to not only innovate and create new designs, but also to continue to improve upon existing products. We are committed to not only delivering better performance but also manufacturing them more efficiently and sustainably. As we discussed in a previous post, before we can manufacture, we must prototype. For this step in the process, we are beginning to explore additive manufacturing, or as it’s more commonly known, 3D printing. 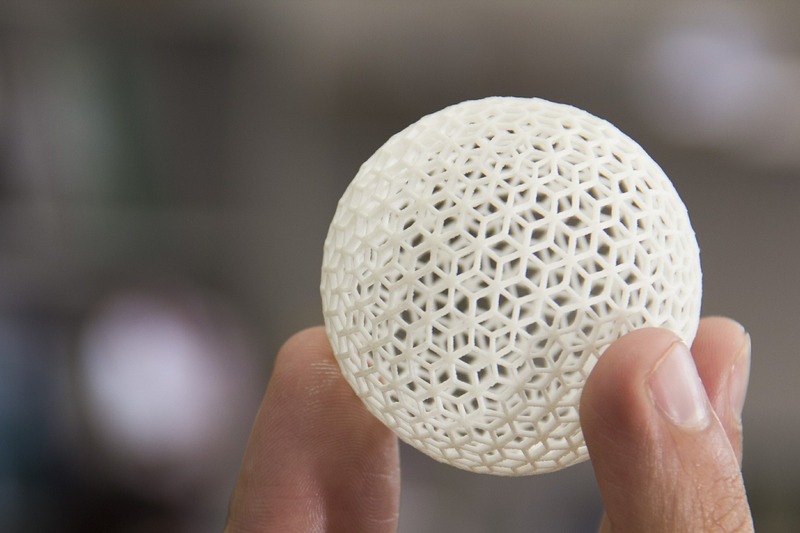 As the name suggests, additive manufacturing involves successively adding thin layers of material together to form a three-dimensional embodiment of a computer aided design (CAD) model. Traditional manufacturing, on the other hand, is normally subtractive. Again, one may infer that in traditional manufacturing, the material (plastic, metal, fiberglass, etc.) is carved, cut, or hollowed out either by hand or using a machine to form the final structure. Reducing material waste. While modern technology has vastly improved subtractive manufacturing, it still has its limitations. One of which is the amount of material waste it creates. 3D printed materials are produced according to the specifications of a digital file, such as a CAD (Computer Aided Design) model created using a modeling software. Alternatively, 3D scanners can scan a solid object and the printing machine can reproduce the object’s shape. Both methods allow the machine to create an exact blueprint to print, leaving little to no excess material. Increased cost-effectiveness. Reducing the cost of materials and labor makes for lower expenses for the rest of the supply chain as well. Manufacturers, not unlike JEM Engineering, must source product components and building materials from qualified vendors. More often than not, there are costly NRE (non-recurring engineering) costs associated with custom components, and in some cases, additional tooling costs whenever previously used tools have worn out. While in the prototyping stage, it is common for there to be a few or even several different revisions made to any single custom component. As one can imagine, such revisions can restart entire processes, including the tooling. More processes = more labor and more materials = more cost. Most importantly, the cost to the manufacturer also drives the cost to the customer. Faster turnaround. Rapid prototyping is one of the primary applications of 3D printing. The aforementioned tooling processes not only cost money but often take a lot of time, especially if during the course of the prototyping stage, revisions are made. With 3D printing, once a revision is made to the digital model, a new physical model can be printed out almost as quickly. The faster the turnaround time of prototyping and production, the sooner the end user will receive the finished product. More complexity. Within certain constraints, such as size, there is almost no limit to the complexity of shapes that a 3D printer can produce. With this capability comes more creative freedom and innovation. Also, more objects can be made as a single piece, making it more durable. Imagine a car with a chassis made of one single piece, whereas with traditional manufacturing, it would have been several pieces welded together. All factors considered, 3D printing unlocks nearly unlimited possibilities for antenna design. Using this technology, our engineers can design antennas in a larger variety of forms to suit our clients’ needs. Perhaps just as importantly, these custom products can be produced faster and at a better value, without compromising quality and performance.